The creation of a musical program is akin to the composition of a meal: a complex balance of flavors, spices, and sensations. The elements of this concert’s menu include high drama, an intimate tone poem, an inventive orchestral gem, and a muscular piano masterwork. Maeterlinck’s tragedy Pelléas et Mélisande inspired many great composers, including Sibelius, Schoenberg, and Debussy, but the first was Gabriel Fauré. His Pelléas et Mélisande suite includes many of the play’s most poignant and tragic moments, from the illicit passion of the lovers to their mortal wounding and death. Gustav Mahler originally conceived his First Symphony as a tone poem in five movements, but he soon extracted the beautiful “Blumine” to stand on its own as a delicate evocation of nature and love. Albert Roussel’s, bright, colorful Concert pour petit orchestre is a rhythmically vital, spirited contrast to both the Mahler before it and the concluding work of the evening. 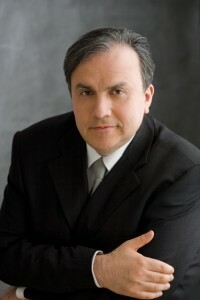 In the hands of Yefim Bronfman, one of the greatest pianists on the world stage, Tchaikovsky’s ebullient Second Piano Concerto will raise the roof at GPAC. With this concert, we celebrate the range, diversity, and distinction of the contemporary chefs of Memphis. More than ever, Memphis is a culinary destination, not only for its justly famous barbeque, but also because the city attracts and nurtures bold chefs of every cuisine. Like IRIS, the chefs of Memphis honor their past. The heritage of Southern food ways will always be cherished here. At the same time, like IRIS, the chefs of Memphis are daring, willing to push the culinary envelope. Our chefs are fiercely proud of their local ingredients, but their accolades are national and international: Memphis is home to multiple winners of Food & Wine magazine’s “Best New Chef” award; the city also boasts James Beard semi-finalists and finalists, one of Bon Appetit’s “50 Best New Restaurants in America,” and the holder of the French award for Master Chef of the Year. And it wouldn’t be Memphis if one of its chefs had not been named “Prince of Porc” in the national Cochon555 competition. In conjunction with this concert, IRIS will challenge the top chefs of Memphis to create a four-dish tasting menu inspired by the evening’s program. 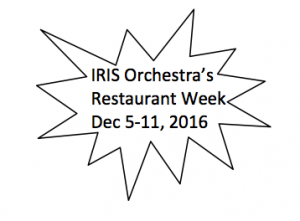 IRIS concertgoers will vote for their favorites, with the winning chef gaining bragging rights, a half-page ad in the IRIS program, and a mini-concert by IRIS musicians in their restaurant, exclusively for their patrons.